CALGARY -- The Calgary Flames realize their game Tuesday against the Boston Bruins isn't just a weekday, out-of-conference contest in the middle of December. It's the first return of a franchise face. The game marks the first time longtime captain Jarome Iginla returns to Calgary since he was traded to the Pittsburgh Penguins on March 27, ending his storied 16-year tenure with the only NHL team he had played for. "It's going to be a great day for Jarome to come back," Flames coach Bob Hartley said. "Unfortunately in this business you get traded and you need to be in the next city in the next few hours so you don't have time to say thank you the right way. We know how classy this organization and our fans are. [Tuesday] I'm sure that they'll have a chance to say thank you to Jarome and it's going to be the same thing for him. I'm sure he'll want to show his appreciation to our fans." Twelve hours after the trade with the Penguins was announced, Iginla bid farewell in a somber but upbeat press conference, leaving Calgary as the all-time franchise leader in games played (1,219), points (1,095) and goals (525). There was no final standing ovation. No celebratory video package. Just a departure to the next NHL city. But Iginla, now a member of the Bruins after signing with Boston as an unrestricted free agent this summer, finally will receive his farewell from the Flames faithful at Scotiabank Saddledome. "It'd be pretty hard to believe he wouldn't get a very warm reception," said Mark Giordano, who inherited Calgary's captaincy from Iginla. "He meant a lot to this organization. He's such a good guy. It goes without saying. "He's a Hall-of-Fame player. In my opinion probably the most recognizable Flame that this organization looked to for a long time. He was a big part of our team. He was a great guy. Obviously last year it was tough to see him go but [Tuesday] is going to be special." Iginla may be gone from the Flames' dressing room but his impact still is felt. After he served as team captain for nine years, many lessons, much like the torch, has been passed to Giordano. "What I took from [Iginla] was the way he treated people and the respect he showed for everyone, really," he said. "Me coming in here from my first year to playing with him last year, he treats you with a lot of respect, he's very kind and you can learn a lot from a guy like that in how he treats other people." Rookie Sven Baertschi, who made his debut with Calgary as an emergency call-up from the Portland Winterhawks of the Western Hockey League in 2011-12 at age 19, came away with a similar impression. It didn't matter who you were, Baertschi said, the respect from Iginla was there. "It's so hard to describe," he said. "Out of nowhere you just get called up from juniors and then you come in here and you sit right beside him. That was one of the highlights of my career, maybe the biggest highlight for me. I've got so much respect for him, and being around him I was always a little nervous. I didn't know what to do. Is he going to get mad at me? "Then I realized he was just a normal guy and he treats everybody well. He'd be the guy who opens up the door for you. He's just a really humble guy." It's the picture that the always-humble Iginla spent a decade and a half painting in the Calgary community. "He wasn't just the face of the franchise, he was the face of the city," Joe Colborne said. "There are very few players who interact and have that good of a relationship with the city as Jarome did." The 23-year-old Colborne grew up in Calgary watching Iginla but never got the opportunity to share a dressing room with him. He joined the Flames organization in September. "Talking with guys that played with him, it was not like he was putting on a charade for the fans and behind closed doors he was different," Colborne said. "He was the stand-up guy that everyone thought he was and it's going to be a fun game, not just because of that but because the fans are going to be excited and it's going to be a great atmosphere." But with as much buzz and as much respect as Calgary will show Iginla in his return, the Flames already have addressed the emotion -- and circus -- to follow. "We addressed it because hey, it's a part of [Tuesday]," Hartley said. "We can't get caught by surprise or get caught by all the media attention or anything. That's part of the job that we chose. It's great. I feel privileged to be a part of [the game] to see Jarome back over here. "The simple way to look at it from a Calgary Flames standpoint is that we need two points. As much respect as we have for Jarome I want to see my team on its toes and play the same game as we played in Edmonton on Saturday night." And while it won't necessarily be like Calgary's 2-1 overtime victory against the Edmonton Oilers, what's on the line is the same two points. 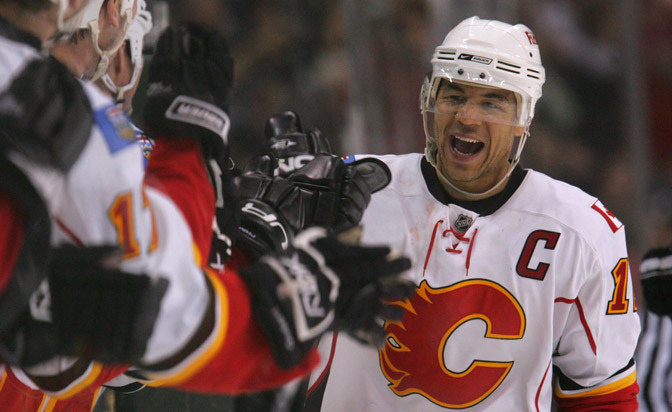 Even if Iginla's return isn't just another game for the Flames.